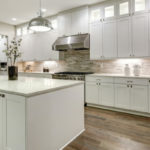 Buying wholesale cabinets and countertops, installing the right lighting fixtures and using scrap countertop materials to add a backsplash are just some of the many ways you can score a designer kitchen on any budget. You’ll save a ton of money right from the get-go by purchasing wholesale cabinets and countertops at Tops Kitchen Cabinet. 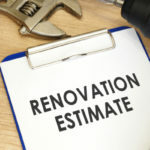 Contractors and retail storefronts have huge markups on materials that can tack on thousands of dollars to your remodel. As a result, you’ll have to cut corners in terms of materials and luxury add-ons but there’s no reason why you have to do this. By simply buying wholesale countertops and cabinets you save enough money to afford higher quality materials and an overall higher-end look. If you start browsing high-end kitchens you’ll notice they all have uniquely beautiful lighting fixtures. Lighting is a necessary component of every kitchen and properly applied fixtures create height and dimension that keep the eye moving around the space and noticing all of the detailing. Your kitchen can score this same high-end look without breaking the bank. Start browsing yard sales and discount stores for pretty chandeliers, hanging lights and other eye-catching fixtures that complement your décor. You might be surprised how affordable these pieces can be, plus they are going to add a lot of appeal to your space. If you need more cabinet space but don’t have the budget to add more cabinets, open shelving is an ideal concept. Not to mention, some high-end kitchens rely on the look as well, simply because it looks really cool. You could even add your own shelving to your kitchen; it’s really that simple. Purchase some shelves that go with your overall kitchen décor and spend an hour or so hanging them up. You could easily accomplish this for well under $100, all the while adding more storage space and style to your kitchen. Many high-end kitchens rely on the same materials for the countertops and backsplash. If you have any leftover materials from your countertops it’s virtually free to add them to the backsplash, minus the cost of labor. 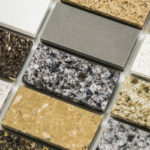 If you did not add new countertops or want to use a different material for the backsplash, ask about scrap tiles, granite and other materials that may be available at a discounted cost. These scrap materials are leftover from other kitchen remodels, but because they are in such small quantities they are offered at a discounted price, and sometimes even for free. Cabinet door handles and pulls come in all shapes, styles and colors. If you do some digging you can find standout options for really cheap. As long as they fit your style door it should be easy to install them. As a result, you get an eye-catching addition for hardly any money at all. Mix and match handles or go for something a little more non-traditional, they are so easy to change out in the future it’s a great place to play around. There are certain kitchen appliances you can’t live without and as a result they live on your countertops or throughout your kitchen on display 24.7. If you have to buy a toaster, mixer or oven you might as well make the most of it. Think of these appliances as decorative elements of your kitchen. Seek out fun pops of color or unique styles that go with your overall décor. You can purchase molding for cheap and then hire a handyman to install it on baseboards and at the lip of the ceiling. Moldings add a luxurious element to your space for very little money as long as you shop smart. Pair a kitchen remodel with new bar stools and a new kitchen table and chairs and you’ll leave your bank account screaming— HELP ME! You can always invest in new furniture down the road, after your bank recovers from the remodel. In the meantime, all it takes is a coat of paint and some DIY handiwork to transform your old furniture into something new. High-end kitchens don’t typically have bare walls; every space is used to infuse design and function. 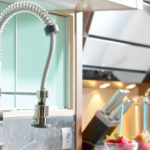 There are countless ways you can spruce up kitchen walls without spending a fortune on fancy art or additional cabinets. For instance, if you have some nice plates you usually keep stored away you can hang these up on a wall. You could also paint a wall with chalkboard paint in order to create a fun and trendy space to post recipes, messages and more. If you really want to put up artwork go to art sales and discount stores where you can find artwork of varying types for a steal of a deal. 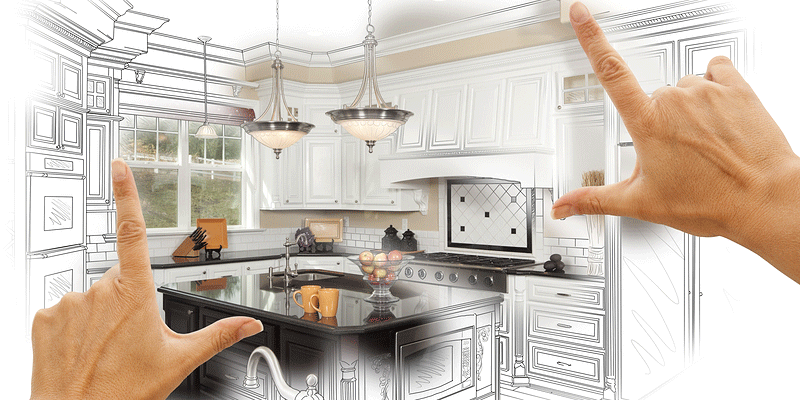 Score the kitchen of your dreams for less with Tops Kitchen Cabinet! Contact us today to learn more about wholesale cabinets, granite countertops and more.